In the opening months of 1949, U.S. President Harry S. Truman found himself faced with a looming diplomatic catastrophe--"perhaps the greatest that this country has ever suffered," as the journalist Walter Lippmann put it. Throughout the spring and summer, Mao Zedong's Communist armies fanned out across mainland China, annihilating the rival troops of America's one-time ally Chiang Kai-shek and taking control of Beijing, Shanghai, and other major cities. As Truman and his aides--including his shrewd, ruthless secretary of state, Dean Acheson--scrambled to formulate a response, they were forced to contend not only with Mao, but also with unrelenting political enemies at home. Over the course of this tumultuous year, Mao would fashion a new revolutionary government in Beijing, laying the foundation for the creation of modern China, while Chiang Kai-shek would flee to the island sanctuary of Taiwan. These events transformed American foreign policy--leading, ultimately, to decades of friction with Communist China, a long-standing U.S. commitment to Taiwan, and the subsequent wars in Korea and Vietnam. 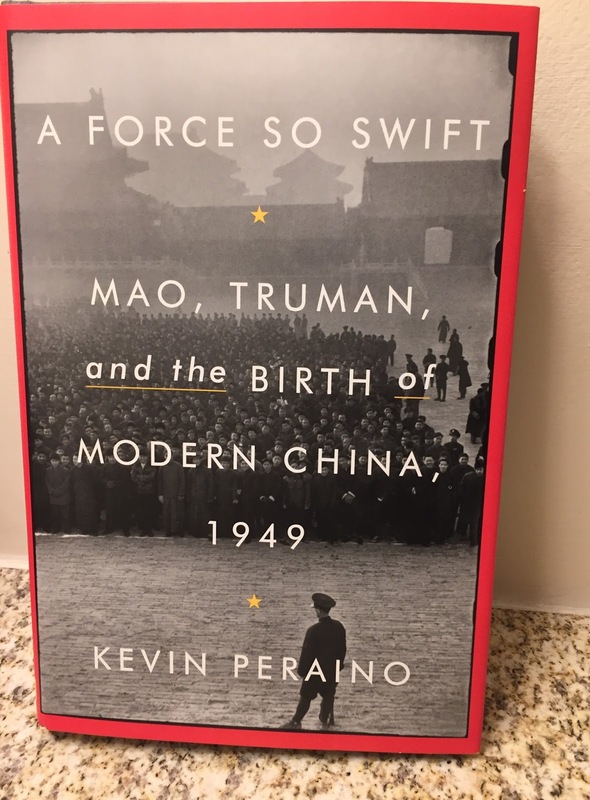 Drawing on Chinese and Russian sources, as well as recently declassified CIA documents, Kevin Peraino tells the story of this remarkable year through the eyes of the key players, including Mao Zedong, President Truman, Secretary of State Acheson, Minnesota congressman Walter Judd, and Madame Chiang Kai-shek, the influential first lady of the Republic of China. Today, the legacy of 1949 is more relevant than ever to the relationships between China, the United States, and the rest of the world, as Beijing asserts its claims in the South China Sea and tensions endure between Taiwan and the mainland. My Thoughts: I received this book for review from the publisher, but this in no way effects my review. I haven't been able to read a history book in quite awhile so I was happy to get to do so, especially one about China. I couldn't believe how many details that were in this book, so many that I've missed in my history classes. This is a well thought out analysis that seems to get it all! A great read for someone into history.